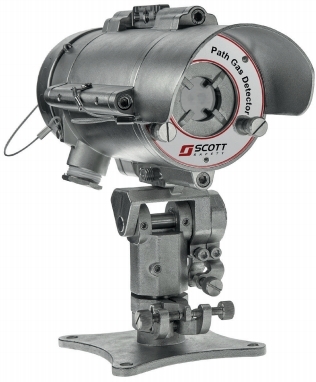 The Sabre Safety SPYGLASS Open Path Detector is an innovative, next generation solution to open path combustible gas detection. It can replace multiple point detectors, detects multiple gases at once, and is durable, proving to be a smart, cost efficient choice for combustible gas detection. One Sabre Safety SPYGLASS Open Path Detector can replace up to 20 point combustible gas detectors in line-of-sight applications, saving installation and ongoing maintenance costs. With the SPYGLASS there are only two units to service and the maintenance requirements are minimized compared with point detectors. Additionally, there is only one consumable to replace periodically; SPYGLASS Xenon Flash Bulb has a 10 year warranty. The SPYGLASS IR sensor can detect multiple combustible hydrocarbon gases at the same time-perfect for facilities with multiple hydrocarbon gases to monitor, such as C1-C8 hydrocarbons (Methane, Ethane, Ethylene, Propane, Propylene, n-butane, Isobutane, 1, 3-butadiene, Isobutylene, Alkanes, Alkenes, Naphthenes, Benzenes). Robustly designed to handle the toughest work environments and maintain a long operating life, the SPYGLASS Open Path Gas Detector is equipped with 316L stainless steel casings and mounts, coated circuit boards for protection, and is SIL-2 approved per IEC61508. Additionally, the SPYGLASS detector meets MIL-C-810C standards for humidity, salt, fog, vibration, mechanical shock and temperature extremes, while the housings meet IP66, IP68 and NEMA 250 6P water and dust egress standards.